First things first, Hop Leaf is for adults only. And by adults we mean you have to be 21 years of age or older, because god knows we wouldn’t be welcome if “adult” was actually a defined term with specific behavioral requirements. Luckily, a valid ID will gain you entry, where you are free to act as immature as you please in this judgment free zone. Judgement from us, at least. We don’t really know the general consensus on what the word “gastropub” means these days, but for us, Hopleaf embodies the term. 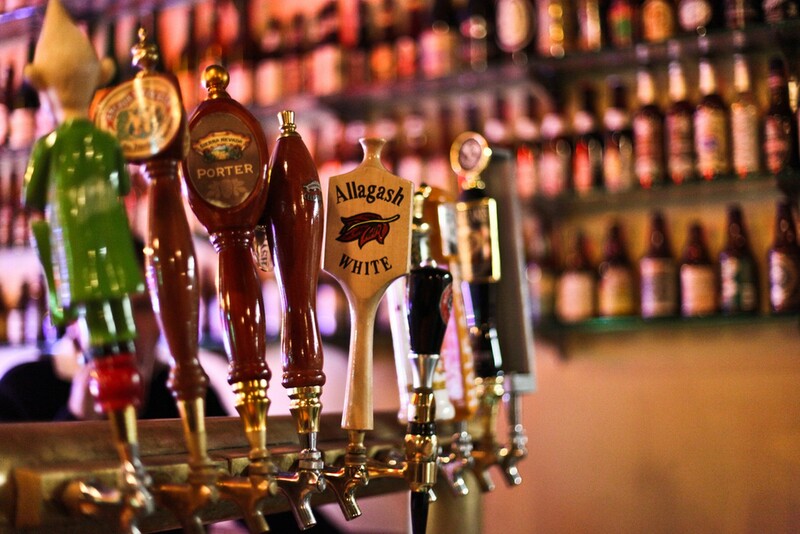 It’s a bar with an exceptional beer selection and a food menu that goes above and beyond. The mussels and CB&J; are the signature dishes, and the duck reuben and steak frites are next on our hit list, but you can get a more complete rundown on the food below. If you live anywhere around the Uptown, Edgewater, Lincoln Square area, Hopleaf should be your jam for a casual bite and a beer. And judging by the people packing into the place on the weekends, we know this isn’t news to those of you who live nearby - it’s the rest of the city who should be more aware. Hopleaf is broken down into a bar area in the front, which you walk through to arrive in the more traditional restaurant part in the back. That being said, the bar has some small tables for you to drink and dine, but it won’t be the same kind of service as the rear. If you’re looking for a more sit down meal feel, head to the back where you’ll be well taken care of. If drinks are what you’re more interested in, the bar is for you. And, if you just don’t care, we suggest going with the first available spot, because that may be your best bet either way. We also encourage getting lost in the beer booklet and trying a cold one you’ve never had. Whether you just turned 21 or 31, we think you’ll find something new. Happy Birthday, it’s all downhill either way. So simple. So basic. So much better than anything out of a bag. Not your everyday bar food item. Grilled hearts of palm with shaved asparagus, toasted almonds, orange supremes, red endive, and herb vinaigrette. A really interesting combo with unfamiliar but great tastes. We like our mac and cheese as mac’y and cheesy as possible. A little more cheese here wouldn’t have hurt. Lamb meatballs with creamed farik – which is kind of like wheat bulgur but not exactly – minted pea yogurt, and cucumber relish. The meatballs are very distinctly lamb, and very distinctly good. The signature is a Belgian-style sauce steamed in a white ale with sliced shallots, celery, thyme, and bayleaf. There is also a second sauce option, which varies with the season. Available in two sizes, it’s coming with fries and aioli either way. These aren’t the best mussels you’ll ever have, but better than average bar food. A heaping portion of french fries with a large cup of aioli will keep you occupied too, and fancy garlic mayo gets us every time. We never thought a variation on peanut butter and jelly could be so good. This house made cashew butter and fig jam version with a little raclette cheese is pan fried on sourdough. Takes PB&J’s to some next level sh*t.